Сейчас Вы просматриваете программу, находящуюся в категории(ях): Мультимедиа софт / Редакторы видео. Далее Вы сможете посмотреть полную новость программы, которой Вы заинтересовались. Для того, чтобы бесплатно скачать GiliSoft Video Editor 8.1.0, прокрутите страницу вниз до окончания полной новости и перейдите по указанным ссылкам. Приятного Вам скачивания! GiliSoft Video Editor - это продвинутая и очень удобная в работе программа для быстрого редактирования видео наиболее распространённых форматов (AVI, MPEG, MPG, MPEG-1, MPEG-2, MPEG-4, WMV, MP4, MOV, VOB, ASF, 3GP, 3G2, SWF, H.264, QT, DAT). При использовании данного программного обеспечения можно быстро вырезать из видео отдельные фрагменты, объединять несколько фрагментов видео в один файл, работать с субтитрами и др. Всё заключено в симпатичную графическую оболочку и каждый вид редактирования можно выбрать независимо от других. Особенности: • Возможность объединения нескольких видеофайлов в один • Разделение видео на несколько сегментов • Вырезание и удаление ненужных фрагментов видео • Настройка параметров видео (частота, разрешение, скорость передачи данных) • Работа в фоновом режиме • Наличие встроенного проигрывателя • Добавление субтитров и водяных знаков • Поворот видео на 90/180/270 градусов • Объединение нескольких аудио файлов в один • Настройка последовательности вывода видео файла Поддерживаемые форматы входных файлов: AVI, MPEG, WMV, MP4, FLV, MKV, H.264/MPEG-4, DivX, XviD, MOV, RM, RMVB, M4V, VOB, ASF, 3GP, 3G2, SWF, H.261, H.264, DV, DIF, MJPG, MJPEG, DVR-MS, NUT, QT, YUV, DAT, MPV, NSV Video (*.mts, *.m2ts), H.264/MPEG-4 AVC (*.mp4), MPEG2 HD Video (*.mpg; *.mpeg), MPEG-4 TS HD Video (*.ts), MPEG-2 TS HD Video (*.ts), Quick Time HD Video (*.mov), WMV HD Video (*.xwmv), Audio-Video Interleaved HD Video (*.avi) Выход поддерживаемых форматов файлов: AVI, MPEG, WMV, MP4, FLV, MKV, H.264/MPEG-4, DivX, XviD, MOV, RMVB, ASF, 3GP, 3G2, SWF, VOB, TS, DV Video H.264/MPEG-4 AVC (*.mp4), MPEG2 HD Video (*.mpg; *.mpeg), MPEG-4 TS HD Video (*.ts), MPEG-2 TS HD Video (*.ts), Quick Time HD Video (*.mov), WMV HD Video (*.wmv), Audio-Video Interleaved HD Video (*.avi) Powerful Video Cutting Function It is common to shoot far more footage than you actually need and choose only the best material for the final edit. Easy Cutter of GiliSoft Video Editor can easily cut a long video file into many smaller different video parts with no quality loss. Often you will shoot several versions (takes) of a shot and choose the best one when editing. Batch Cutter of GiliSoft Video Editor helps you cut multiple video files at the same time in batch mode. Adjust Video Speed, Add Effects Effect of GiliSoft Video Editor helps you adjust video speed or add a lot of picture effect (Black and White, Old Film, Embossment, Carving, Wood Carving, Pencil, Posterize, Oil Painting, Mosaic, Negative, Glow, Haze, Fog, Motion Blur) to video. It supports instant preview, you also can adjust video brightness, contrast, and saturation at the same time. Advanced Video Cutting Function Advanced Cutter of GiliSoft Video Editor helps you cut video into several parts and provides lots of video editing functions to make a great home movie: adding watermarks, adding subtitles, video rotation, video cropping, brightness adjustment, filter effects and so on while video cutting. Many videos can be dramatically improved by simply getting rid of the flawed or unwanted bits. Advanced Cutter also supports deleting unwanted video clips from video file. Powerful Video Joiner Joiner of GiliSoft Video Editor is a professional video file joining tool which join or merge multiple video files into a large one. Users can choose whether to add the fade in/out effect to videos by their own wills. It supports joining the same format video files without encoding SUPER-FAST merge and supports joining different formats of video files and select any format one of the file as the output format, or set a custom output format. Powerful Video Splitter Splitter of GiliSoft Video Editor is perfect video splitting software to split video files into several segments easily and fast. It supports splitting by time, for example every 600 seconds (5 minutes) per segment. It supports splitting by file size, such as 100 megabytes per segment. It supports customize Split, you can set the Split Point by hand. Adding Music to Video Sometimes music can have a dramatic effect on our perception of a video – no matter whether it’s a movie, a commercial, or a video presentation. But what if all you have is silent footage or a video with just a few snippets of voice commentary that really needs some music to make it interesting? With Add Music of GiliSoft Video Editor, you can easily add an audio track in MP3, WMA, OGG, or FLAC format to your MP4, AVI, or any other format video and save it as a new file. Easy Video Cropper There will undoubtedly be times when you need to crop your videos to remove any unwanted areas. For example, when you got some video files with black bars on top and bottom or you want to crop videos with large dimensions to fit the small screen of devices. Cropper of GiliSoft Video Editor is a powerful video editor that not only crop your video files, but also allows you to enhance the video with visual effects, titles and more. Rotate Video It’s an error made by many. When filming with your cellphone, or even a real video camera, you’re not always thinking about ‘orientation’ – whether you’re filming in portrait or landscape. Some devices take into account every flick of your wrist, but most don’t, and you end up with a video that’s rotated by 90 degrees. Rotate of GiliSoft Video Editor may help you rotate video file and it works pretty well. 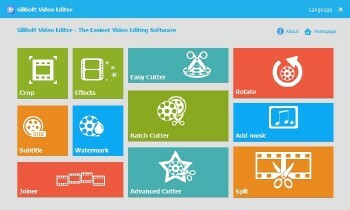 What Does Gilisoft Video Editor Do? Nearly everyone can shoot video, whether using a digital camera, smart phone, or a dedicated camcorder, but raw video isn't fun to watch. GiliSoft Video Editor may help you make awesome edited movies, it cut and join video clips with zero quality loss, apply stylish video effects and filters, add music, titles, and much more! Most videos serve a purpose such as telling a story or providing information. With GiliSoft Video Editor you can Choose the best footages; Remove unwanted footage; Join the best material into movie; Add effects, graphics, music, texts; Alter the style, pace or mood of the video. Gilisoft Video Editor is available in Chinese, English, French, Italian, Japanese, Portuguese.